"Hot wire" the coil with the belt on and it will hold the shaft from turning. The plate should slip off with little effort. The snap ring for the bearing needs a bit of patience. Need 90 degree snap ring pliers, and a mirror. Good quality snap ring pliers. No junk. With the snap ring off the pulley/bearing can be pryed off with screw drivers. Goes back the same way. Shims give the air gap clearance to the armature/pulley by trial and error. I gave a young guy working out of his fathers shop 1 hour to do this. My old hands do not do well in tight places. on me once too. but it turned out to be the AC pulley. (pump still connected to lines). degreaser and wash it down first. You will thank yourself latter. Being as how I am presented with a problem of a more serious nature, which I will dedicate a separate thread on, now would be a good time to update the members on the rust bucket. My wife has been driving it for 2 1/2 years now, put 20,000 mi on it, and loves it. During that time I bypassed the AC,(clutch was bad) using a smaller belt. Works just fine for me. Replaced the starter, the pita of that job was, had to do it in her workplace parking lot, haha. Replaced the front calipers, pads and rotors, as one of the calipers was seizing. Passed inspection no problem in May. So, all in all, its been pretty reliable transportation.Stay tuned for the new thread, the rust bucket with transmission woes. Hey jag, what a game. Quick gets all 3 stars in my book. He made it anybodys game. Sorry your team lost, but not near as sorry had it been my teams loss. Back to the job at hand. Yesterday I finished up with the frame and it's components and gave it overnight to dry. 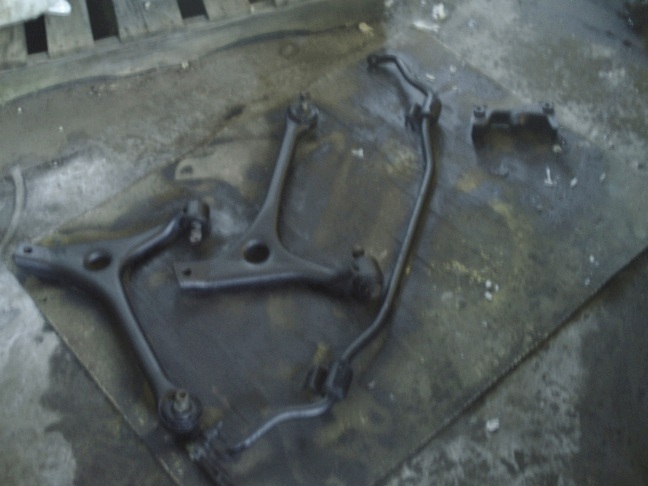 Here are the components,Attachment 88937, and here is the frame,Attachment 88945. This morning I put it all together. Here it sits, ready to be installed.Attachment 88953. I have yet to acquire the heater core bypass assembly and spark plugs, so the frame has to wait until i get that job done. After I finished with the frame, it was time to get on my back and weld some patch work underneath. I will try to get some pics of it tomorrow, but i'm not sure how they will turn out. Hope all is having a good day. I have an '01 Taurus that needs the front frame replaced due to going into a ditch. How difficult was this part of your project? I know they are different generations, but same basic principle. The car itself is in great condition for it's age and to me is worth it. 76,000 original miles in great shape otherwise. I've never tackled this large of a repair, but not afraid to try. I've located the part locally and plan to pick it up this week. 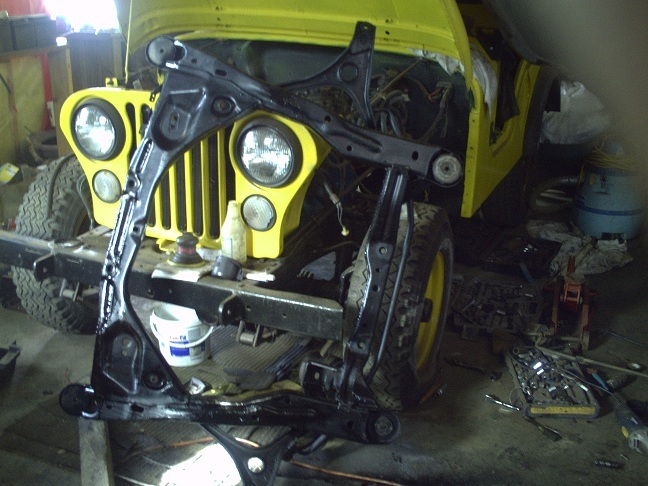 I will be working in the yard to do it, and plan to construct an overhead support for the engine and transmission. 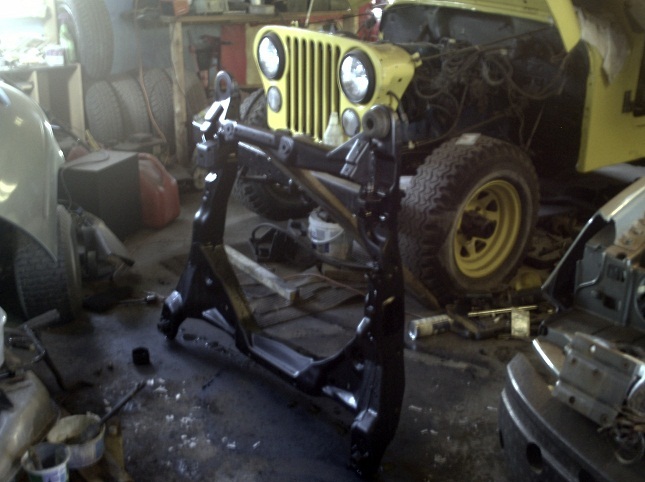 In addition, I will construct another support to completely raise the car off the ground on the back end. Overkill on support, maybe, but safety is a priority. My son and I will be conquering this project. You get get a engine support bracket from harbor freight or other places reasonable. you can then stack tires underneath the hanging engine and get your bracket off. mounts that are rusted out. If You get too boned on the donor, move on to the next car. through the donor is toast. to cause alignment issues. It takes a frame machine to fix that kind of damage if it can be fixed at all.